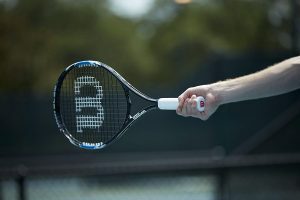 If you are a tennis beginner, this post will help you learn the best way to grip a Tennis racquet. But that’s not all. You will also learn the different types of grips you can master to grip a tennis racket. You will get step by step tutorial and instructions on how to grip as most pro tennis players do. Whether you were looking for basic or advanced instructions on this subject. Ask any tennis player the most important part of a tennis racquet, and they will say the string. Very true. No doubt about that. But do you know what most people forget, which is vital as the string? That small little bit near the end of the handle is often overlooked and neglected. Yet, it plays a huge role in how you play the game. It determines and influences how you hold the racquet and strike the ball at the ideal height. Even pro player replaces their grip on a regular basis to make sure that they are always playing at their best. Gripping your tennis racquet will help you improve your game. Most importantly, gripping your tennis racquet gives your tennis new lease on life. It is the only way of extending the lifespan of your racquet without changing it every single year. 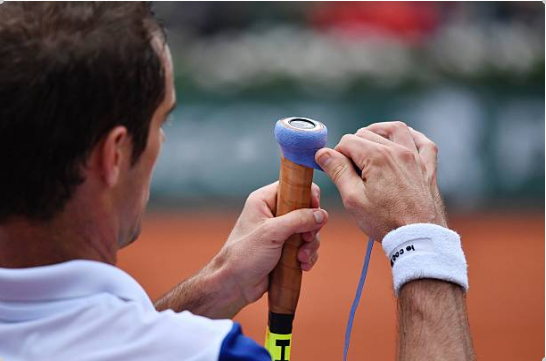 A long time ago, most tennis players used to re-grip their racket when they were changing the strings. It was once or twice a year. But now today, most tennis player like Rafael Nadal grip their tennis racquet in two minutes. If you have watched any tennis on TV. You will see that most tennis players regrip their tennis between sets and they do it very quickly. Sports gears like tennis equipment don’t come cheap. The best way to lower the cost is looking after your tennis racquet, that is stringing and making sure it is re-gripped to extend its lifespan, support you and affect how you positively play the game. This involves replacing any grip you already have on your tennis racquet. If you don’t know this well, you will feel bulkiness if you hold your tennis racquet. And it may feel like a wrong size on your hand. During re-gripping, you will find staples at the bottom, which makes the task of replacing so hard. Those who don’t want to use staples on the grip. That’s fine because of it maybe more frustrating like the sticky tape on the outside. Suppose you don’t remove it, you will feel sickness on your handle and hands. Well, this may have a negative effect on how you play the game. Make sure that you replace the grip well. If you can’t, you can get a player to teach how to do this. It’s not rocket science. It is the easier thing more than replacement grips. That’s because you don’t have sticky tapes or staples. Picture it like removing the sticker or pulling the off the overgrip. It is that simple. It is something you don’t want to stress yourself with if you don’t know. You can get a professional to re-grip a tennis racquet for you. However, it is a good idea to learn how to do it alone. If you learn how to do it, you will customize it based on your comfort level. You will feel if it is the right size for you or not. So here are the basic instructions that you need to follow to re-grip your tennis racquet. If you observe well, you’ll notice a clear plastic on the grip. You need to peel that off. The next thing you need to do is to begin at the bottom of the grip. At the bottom, you will notice a sticky bit that shows which side to place on the racquet. After that, start wrapping the grip around the handle and leave overlap each time. Doing this ensures the grip itself won’t unwind or unwrap. Your job is to keep wrapping it all the way to the top while you do so make sure that it is nice and tight. You can always cut off an extra bit or wrap around it once more at the top. If you have followed the instruction to the tee. The final result is a nice looking tight-fitting tennis racquet. Rome wasn’t built in a day. It was one brick at a time if you want to grip a tennis racquet. There’s no secret around it. You will have to practice, practice until you get it right. The more you practice, the more you will be able to do it under two minutes between sets like pro players to do. With time, you will know how to customize the comfort and the feel by yourself. But the most important thing is, learning and start doing it today. If you have a tennis mate or player, you will also learn a lot about how they do it.